Sen. Max Baucus (D., Mont. ), President Barack Obama’s nominee for the next U.S. ambassador to China, has advised a foundation funded by the U.S. branches of Chinese state-owned banks and companies and a Chinese telecommunications giant accused of spying on Americans. Baucus has advised the U.S.-China Policy Foundation (USCPF), according to the group’s website, which does not mention how long he has served in that role or what his responsibilities were. The USCPF is a nonprofit organization founded in 1995 that "promotes understanding between policymakers, government officials, researchers, and the general public in the United States and in China." Obama announced Baucus, the chairman of the Senate Finance Committee, as his nominee for the next ambassador to China last month. "For more than two decades Max Baucus has worked to deepen the relationship between the United States and China," the president said in a statement. However, Baucus’ ties to the USCPF raise questions about his approach to U.S.-China relations. Annual gala dinners hosted by the USCPF have been funded by U.S. subsidiaries of banks and companies owned by the Chinese Communist government, according to the foundation’s online newsletters and donor categories. The funders include telecom giant Huawei Technologies. Huawei was a "supporter" of the USCPF’s 2012 gala, a qualification that required a contribution of $10,000. A House intelligence committee report in 2012 concluded that equipment installed by Huawei and ZTE Corp. for U.S. companies could be used to "beacon" sensitive communications data back to China and poses a national security risk. Huawei gear is used to manage traffic on wireless networks and experts have said it is vulnerable to hacking by government agents or third parties. Former CIA and National Security Administration head Michael Hayden also said last July that intelligence agencies have evidence of spying by Huawei, which is one of the world’s largest telecom equipment makers. The company has vigorously denied accusations of spying, as well as allegations that it has received substantial support from the Chinese government. Huawei has done business with small U.S. telecom companies totaling about $1 billion in recent years but has more heavily invested in the Asia-Pacific region and Europe. While Huawei was excluded from Australia’s National Broadband Network and has largely been denied contracts with major U.S. firms due to security concerns, the company has completed deals to build telecoms systems in the United Kingdom and South Korea. U.S. branches of the Bank of China, China Construction Bank, and the Industrial and Commercial Bank of China—some of China’s largest state-owned banks—have also donated tens of thousands to the USCPF galas. Other contributors include U.S. subsidiaries of Chinese state-owned telecoms and automotive manufacturing companies and large U.S. corporations. A China expert told the Washington Free Beacon on background that organizations like the USCPF are part of a "new pro-China lobby" that began working with local and state chambers of commerce in the 1980s to curry favor with the U.S. business community. Corporations now fund the USCPF and similar organizations to gain access to Chinese markets and cut through bureaucratic red tape in what the source described as a "self-funding circle." "[The pro-China lobby] has used influence at the state and local level to create an echo chamber for Beijing’s interests that usually coincides with business interests," the expert said. "The kicker is that the Chinese government puts pressure on American businesses now to try to convince members of Congress to advance policies that at a minimum are far less critical of China and even supportive," the source added. The USCPF hosts trips by U.S. congressional staffers and Chinese leaders to the two countries and received more than $1 million in contributions between 2008 and 2012, according to its most recent Form 990 filing. Other advisers for the foundation have included former U.S. Secretary of State Henry Kissinger and Secretary of Defense Chuck Hagel. "The [USCPF] is essentially about trying to get members of Congress to ‘understand China,’" the expert said, "which is roughly translated into leaving China alone today but in the future following China’s orders." Baucus’ ties to the foundation should raise some eyebrows ahead of his Senate confirmation hearings, the expert said. "For Sen. Baucus to be closely aligned, to be listed as a key adviser to this organization makes one really scratch their head," the expert said. "In the old days we would have never chosen an ambassador to the Soviet Union that was closely affiliated with a pro-Soviet organization with close ties to the Soviet regime," the source added. "I don’t have any reason to question the senator’s loyalty to the U.S., but his membership in this organization should prompt interest in his ability to identify Americans’ interests in this relationship and assess his ability to defend them." Additionally, the nomination of Baucus could signal a continued focus on economic and trade relations with China for the Obama administration. 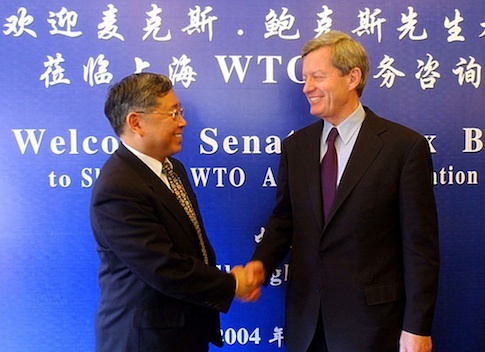 Baucus was instrumental in securing China’s membership in the World Trade Organization (WTO) and has visited the country multiple times. Critics say that focus on business has come at the expense of other troubling issues in China such as human rights. The Chinese government continues to imprison political dissidents, crack down on the media, send North Korean defectors back to that country’s oppressive prison camps, and close down and destroy Christian house churches. Baucus’ appointment also comes amid heightened tensions in northeast Asia. China has declared an air defense identification zone over the East China Sea that partially overlaps Japan’s own zone and the disputed Senkaku Islands, and a U.S.-guided missile cruiser nearly clashed with a Chinese naval vessel last month in the South China Sea. China has also claimed maritime sovereignty over two-thirds of the South China Sea covering disputed fishing grounds. Neither the USCPF nor a spokesperson for Baucus responded to multiple requests for comment. This entry was posted in National Security and tagged China, Max Baucus, Obama Administration. Bookmark the permalink.